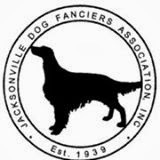 Hubby, Jedi and I are on our way to Ocala for the Jacksonville Dog Fanciers Association shows. I'm rethinking the decision to enter back-to-back shows. I wanted to work on stacking, pacing and baiting between the last show and this one and I haven't done a damn thing. It doesn't help that my new partner started this past week. I'm grateful to have him and I think he'll do well, but training someone to do my job -- while I'm actually doing my job -- is a lot of work. Throw in all the last minute projects my boss (and my boss's boss) want completed before the end of the fiscal year (TUESDAY!) and I have no time or energy left for myself. I was able to shop, pack and iron my clothes. That helps. And this morning I washed and blew out the dog by myself. We found a folding cart on sale at Harbor Freight that we hope will make things easier. Unfortunately, Jedi started limping again just before we left. I'm hoping it'll stop by morning. I can't show a lame dog!